Life Aquatic with Bev… Is water therapy for you? Bev has a love of water and has been fortunate enough to spend almost 20 years working in the area of aquatic physiotherapy (formerly known as hydrotherapy). 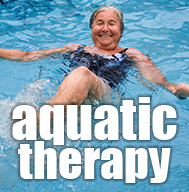 So what is Aquatic Physiotherapy? Aquatic physio is a form of physiotherapy treatment conducted in a heated pool supervised by a physio with special training in hydrotherapy. Clients do specifically designed exercises to help them regain or enhance their physical wellbeing. Patients participating in Aquatic physio have reported many benefits such as: reduced muscle spasm, pain reduction, joint compression and anxiety, increased strength, flexibility, range of movement and cardio-vascular function, improvement with balance reactions and walking ability. It is potentially beneficial for everyone, particularly those with arthritic problems, back pain and those recovering from orthopaedic surgery (eg: after hip/knee replacement). Why do aquatic physio and who can do it? Movement in water is easier than on land. The effects of turbulence and buoyancy, combined with warm water helps reduce pain and spasm. Anyone who is medically stable can do it. You don’t need to be able to swim. After being assessed on land (to ensure that aquatic physio treatment is likely to help your problem and that it is safe for you to exercise in warm water), you will join either a group or individual session. Both these sessions are claimable from your private health cover. I run two sessions per week on a Tuesday and Thursday from 12-1pm at Caulfield General Medical Centre Hydrotherapy Pool (off Kooyong Road). This is a purpose built hydrotherapy pool where the water is regularly checked for hygienic reasons and kept at the optimal 34 degrees Celsius temperature.